The Tweed Museum of Art is celebrating a new exhibit, years in the planning, curated by Karissa White. "Intersections" invites the public to discover the vibrant spectrum of new and old work by Native American in Minnesota. Bringing this show together was a collaborative project, drawing from the Tweed Museum permanent collection to bring forward a generation of work from George Morrison, Carl Gawboy alongside the next generation of Frank Big Bear and Jim Denomie and young local artists like Jonathan Thunder. 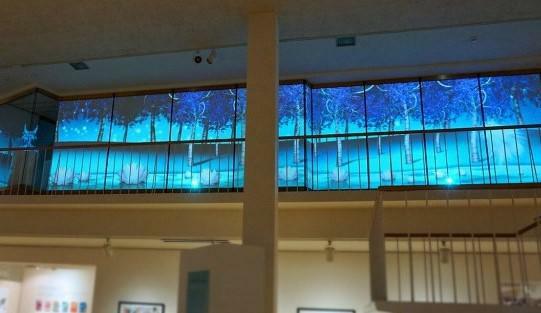 Jonathan Thunder shares a spectacular large projection piece on the Tweed Mezzanine called Manifest’o which imagines traditional stories including Mishu Bizhiw or The Great Lynx, in his dreamscape animation style. The opening reception for Intersections happens at the Tweed Museum on Thursday, Nov.15, 6-8 p.m.
Local artist and writer, Cherie A. Hamilton brings her latest project "Notti Pine and the Dreamtime" to the public in a show at Zeitgeist Arts Cafe in downtown Duluth. A series of paintings that illustrate her young adult novel telling the story of a young girl's spiritual journey. Inspired by native Hawaiian tales and her own multicultural upbringing, Hamilton continues to bridge divides; past and present, young and old, black and white, art and literature. The paintings will be accompanied by excerpts from her novel.